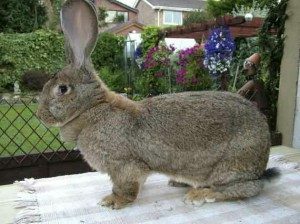 You've found the “Washington Continental Giant Rabbit Breeders” page here at Hobby Farm Wisdom! If this is the first time you have visited our site: Welcome! The Continental Giant is a large breed of rabbit and one of the oldest as well. They are popular as pets thanks to their amiable nature and have also been used for show, meat and fur. There are two varieties of color within the breed: white continental and colored continental. The colored continental can be black, dark steel, light steel, agouti, red agouti, opal and yellow. This breed can weigh up to 35 lbs or more having a semi-arch and mandolin shape with large upright ears and live between 4 to 5 years. Their fur is think and glossy with a roll back. They are very intelligent and friendly and sometimes act like dogs. They’re easy to train and play games with and need a hefty diet of pellets and fibrous vegetables. Can’t find the right Continental Giant Rabbit in Washington? Check in: Oregon, Idaho, California, Montana, or Utah. Or, to see a list of ALL the Continental Giant Rabbit breeders in the US: Click Here!